"Japanese art" - I guess the first thing comes to your mind would be the famous woodblock prints of "Ukiyoe" "Painting of Floating World" of Hokusai or Hiroshige. Van Gogh and Monet were those who were mesmerised by the woodblock prints. There are incredible collectors and researchers in Europe. Byobu (屏風）Japanese Screens date back as early as the 8 th century, are less widely known here in Europe, although they are the "Rolls Royce" of the Japanese art. In the 16th century, castle was decorated to display its wealth and power of the clan and the folding screen was one of the indispensable interior items that had the practical function as well as aesthetic value. Syogun, Daimyo,(Samurai families), Imperial families and wealthy merchants were the patrons of the grand masters, such as Kano Eitoku, (Kano family), Tosa family, Hasegawa Tohaku. 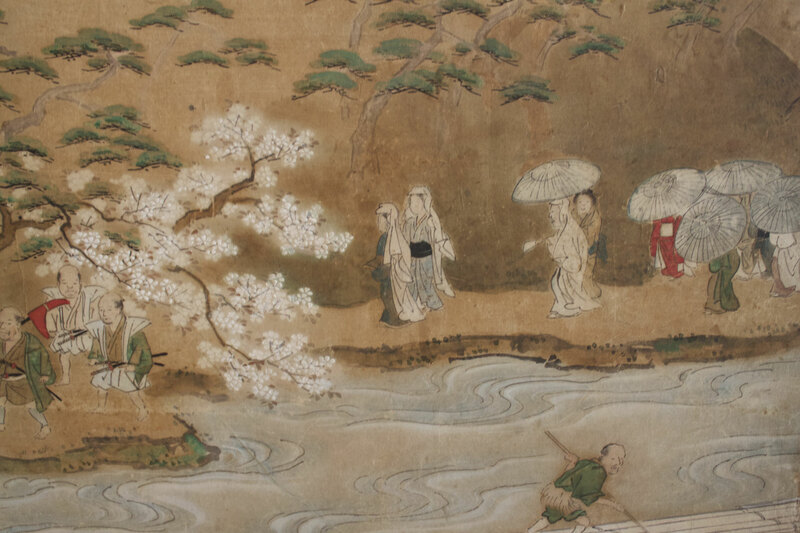 In the 17th century, craftsmen and artists started creating a new style of painting, celebrating the beauty of the ordinal nature 花鳥風月（flower, bird, the wind, the moon) with the sensitivity of each season, in a geometric layout with space, creating silence and perfect balance of light - shadow. Honami Koetsu, Tawaraya Sotatsu and Ogata Korin were the creators of this style. The Japanese art unite us with the nature to create our inner shrine, which later mesmerized many western artists of Art Nouveau. When Japan opened its doors to the world in the Meiji period, the government initiated to introduce Japanese works of art keenly to the west through world exhibitions. American philosopher and Asian art historian Ernest Fenollosa was the one who highly valued the Japanese works of art and dedicated his life work to introduce Japanese works of art to the US. American and European art collectors and dealers also played a key role, such as Siegfried Bing (1838-1905) in Paris. Most celebrated European artists such as Van Gogh, Monet, Klimt who were among those got deeply inspired and influenced by the Japanese works of art. As we all know about Japonisme movement in Europe and intense influence in the development of Art Nouveau, as we see in Emile Galle ‘s glass works. Could we even say that Art Nouveau was perfected with the influence of Japanese aesthetic principle?? In the Netherlands, when we formed the trade partnership in the 17th century, our “conditional love affair” began. 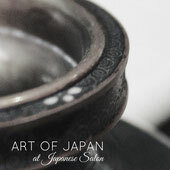 During the Edo period, the porcelains and lacquerware were the important trade items. Close cultural exchanges have been very actively made ever since and Japanese and Dutch creative professionals keep inspiring each other. Besides commercial trade, our “unconditional” love affairs of two nations can be seen in art and design world these days. "All my work is based to some extent on Japanese Art...."
In addition to my love for Japanese folding screens, my attention goes to the art and design which bring timeless elegance and inner peace and helps to create our inner shrine everyday. My recent catch was this lighting sculpture “Flintstones” by Dutch designer William Brand (Design studio, BRAND VAN EGMOND). "Flintstones" struck my heart, as I subconsciously associated with my innate Japanese aesthetics. 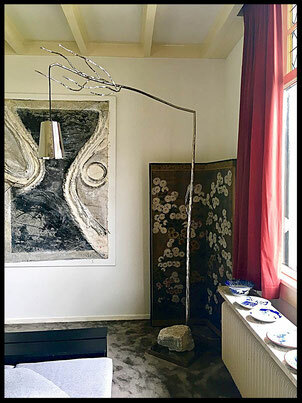 I invited “Flinstones” to my Japanese SALON – to mix and match - Dutch contemporary design with 300 years old rimpa school folding screen, both sharing the same aesthetic principle of bringing the nature into the home. The Bold perhaps masculine idea of placing a real rock, combining rather feminine art nouveau alike delicate tree branches, making a perfect balance. 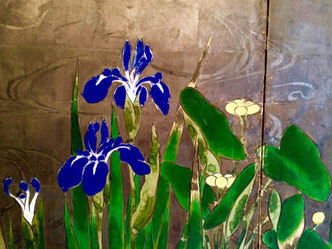 Reminding me of Japanese art form of "Bonseki", creating a landscape with a rock in a lacquer tray. Feel the nature, connect with your inner shrine.